An official visit to the East coast provided an excellent opportunity to bike in the US. The next 3 posts are about my latest exploits from the mouth of guest writers on my blog. Keep Visiting!! 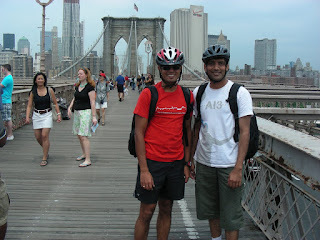 Introducing Srikanth, my cousin from New Jersey, who kept me fantastic company as we cycled on the biking trails and the one-way streets of NYC. Here’s the report straight from Srikanth!! It’s has been on my mind for quite some time but thanks to Manoj's NYC visit, my bike trip on NY streets became a reality and a pleasant one too. I had bought my Trek7.3 FX just a few days back and was wondering what would be the best way to satisfy the desire to play with a newly bought toy. Right then Manoj called me and said he was planning to visit the city over the weekend. From then on the trip just happened. Started morning 7 o'clock from home riding on my bike to the NJ transit station. Blame it on my stiff muscles or the early morning chillness during spring, that 10kms turned out to be the toughest stretch of the day!! God I had to do that wearing my jeans, which would eventually end up half way across the globe in Shreya's washing machine in a few days :D. Taking my bike in the train was the part I was most uncomfortable with. Mainly because I had never done it before and I was very skeptical about carrying it on the narrow escalators in Penn station. Escalators that would cramp and suffocate commuters even without a bike. 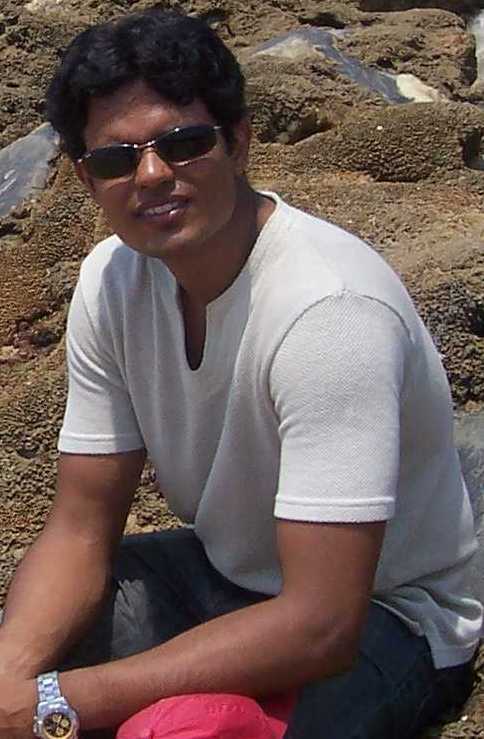 Thankfully I had no horror stories to share with Manoj. 90 minutes gone and I was out on 32nd street, New York, the concrete jungle where dreams are made of!! In no time I was there at Bops place and in even less time was out of there too. On FDR drive towards Brooklyn Bridge and a ride across it. Then on to Little Italy where we stopped over for lunch. From there on we cycled across lower Manhattan, along Hudson bay went past USS Intrepid and all the way to George Washington Bridge. We could have gone even further but I had a train to catch back home and we had to plan for that. On our way back we went into Central Park and then on to Times Square. This is where we had to go different ways as I had train on my mind and he had Asics shoes on his. On my way back in train I shared the coach with a group of Puerto Ricans. Drunk yet sober after their annual Puerto Rican day celebration (it was actually the day before). Some of them were bikers and we traveled talking about our trips. Once at Long Branch it was 14kms ride back home. Back from what would be my best visit to the city, I've visited NYC at-least 10 times before and never have I remembered my trip to such details even after a month. I also realized the best way for me to explore any city. 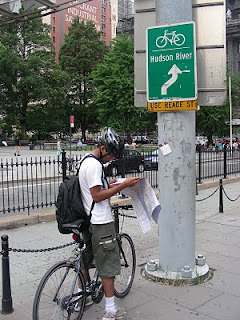 Hopefully, more such bike trips in the US.